To ice, or not to ice, that is the question! At one point we have all hurt ourselves or gotten injured and been told to “rest and put some ice on it” – but is that the best thing for us? The R.I.C.E principle, created by Dr. Mirkin in 1978 stands for Rest, Ice, Compression and Elevation and has been a standard of care for musculoskeletal injuries for the past 40 years. Twist an ankle? Slap some ice on it. Pull a muscle in your shoulder? Slap a bag of frozen peas on it. So, what’s the problem? What we are now finding is, that while icing an acute (recent) injury delays inflammation and swelling, it doesn’t prevent it. As soon as the injured tissues start to warm up (after icing), the inflammatory process restarts, and your body begins the healing process all over again – including a natural increase in fluid at the injury site to help with tissue repair. Ice helps provide some temporary pain relief, as it numbs the injured area and blocks pain signals to the brain, but this is where the benefits of ice may end. Even though ice is the initial treatment of choice throughout the medical community, there is little to no research providing its effectiveness (other than temporary pain relief). 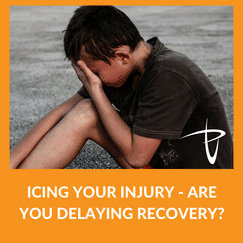 An article published in the Journal of Strength and Conditioning Research reported that icing immediately after injury actually delays healing time and recovery. By slowing down the body’s immediate reaction to a muscle strain by using ice, you delay the release of IGF-1 – a hormone used to aid tissue repair. Not only that, but following a painful injury you’re more inclined to rest (from the R.I.C.E acronym) far longer than necessary. Prolonged rest will lead to decreased muscle strength and flexibility – again, delaying recovery. So, if I shouldn’t ice, what should I do? There are a handful of things that you could do following a recent injury, but first, let’s go over something. More often than not, the pain you feel isn’t actual tissue damage; it’s the brain and your nervous system warning you that something ‘unusual’ has happened. The latest research tells us, and be sure to remember this, that pain does not equal tissue damage. Have you ever stubbed your toe in the middle of the night? With the amount of pain you experience, you would believe things are torn and broken, at the very least! Forty years later, even the creator of the R.I.C.E principle is now recommending big changes to his initial work – even going as far to suggest getting rid of the ‘Rest’ and replacing with ‘P’, and ‘OL’. With ‘P’ standing for protection, and ‘OL’ representing optimal loading. If you just suffered an ankle sprain, pulled a muscle in your shoulder, or twisted your knee, what does the latest research suggest you do? Protection – during the first couple of days after an injury, you should rest a little. That isn’t to say, stay on the couch or in bed, but limit your activity to levels that your body allows. During this time, you may need to use braces or crutches – but only for a short period of time! Optimal Loading – while protecting your injury, you should begin gentle, controlled motion of your joints and try increasing this motion daily. This will prevent delays in healing, allow improved blood flow to your injury site, and decrease swelling by using your muscles to pump out the inflammation. Ice – use ice as a viable alternative to drugs and pain medication, but realize it won’t help with swelling or inflammation. As mentioned, ice will help numb the area and decrease pain, but little more. Compression – this will aid in decreasing swelling and edema throughout the injury site by increasing pressure within the tissues and improving perfusion of the area. Elevation – this uses gravity to help move the swelling out of the injured area and can be done for hours at a time to help in recovery. Ice does have a place in rehab or injuries. With acute, recent injuries it serves as a great alternative for pain management and is much better than using Percocet or Vicodin – but you have to remember the ultimate goal of using ice. To decrease pain? Go for it. To get rid of swelling or inflammation? Think again! Use your body as a guide and stay active. A native of Sheffield, England, Matthew Turner moved to North Carolina in 2016, with his wife Rachael, and has worked in an outpatient orthopedic setting, specializing in manual therapy. Matt is the Facility Director and lead physical therapist for the PHOENIX Rehabilitation and Health Services, Charlotte location. Matt's clinical expertise focuses on outpatient orthopedics, post-operative conditions, concussion, and sports/work-related injuries. Matt underwent post-graduate training with NAIOMT and is a Certified Manual Physical Therapist. He is also certified in Dry Needling and Blood Flow Restriction Training.